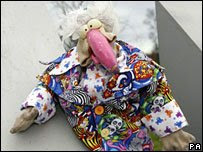 Have you seen Dustin The Turkey, the Irish entry for the 2008 Euro Vision song contest? Now the Euro Vision song contest has a history of weird and wacky entries but this one is way off the chart! Ireland have won the contest several times, was this their way of saying 'We don't want it any more, please, we can't afford it' surely this is the only excuse for such a song? If it was, well it worked, they flunked at the semi final stage, thank God, well it is pretty fowl! This one gets my vote as Terrible Turkey Song of the week!